Reliable Controls | SMART-Space Controller Released! 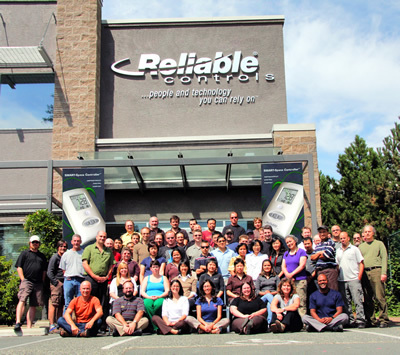 Reliable Controls is very pleased to announce the release of the SMART-Space Controller. This compact and fully programmable BACnet® controller is designed for small point-counts that require a local LCD display and easy access to setpoint adjust, point override and schedule changes. The controller can be configured for standalone operation, or can be networked on BACnet MS/TP for distributed applications. Standard features include up to 4 outputs and 3 inputs, a dedicated onboard temperature sensor, and optional features include any combination of occupancy sensor, humidity sensor, or real-time clock. The standard SSC model has 2 universal inputs and 2 outputs jumper selectable to be either universal or TRIAC. The package model (SSCP) and enhanced model (SSCE) provide an additional universal input and additional TRIAC outputs. All models support BACnet MS/TP and auto-Baud/auto-address functionality.